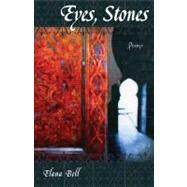 In this debut collection, "Eyes, Stones," Elana Bell brings her heritage as the granddaughter of Holocaust survivors to consider the difficult question of the Israeli Palestinian conflict.The poems invoke characters inexorably linked to the land of Israel and Palestine. There is Zosha, a sharp-witted survivor whose burning hope for a Jewish homeland helps her endure the atrocities of the Holocaust. And there is Amal, a Palestinian whose family has worked their land for over one hundred years-through Turkish, British, Jordanian, and now Israeli rule. Other poems-inspired by interviews conducted by the poet in Israel, the Palestinian territories, and America-examine Jewish and Arab relationships to the land as biblical home, Zionist dream, modern state, and occupied territory.